Our "core DNA" is casual radio operating, contesting, and building stuff. What's with all the military jargon? We sort of have a fetish for Military Surplus hardware. This includes but is not limited to trucks, trailers, towers, tents and anything else useful. No weapons yet, but we're open to new ideas. Honestly, unless you're talking Heavy Artillery we're probably not interested. What's the significance of the number 721? That's more complicated, the most we can offer is this video as an explanation. What kind of club are you?? 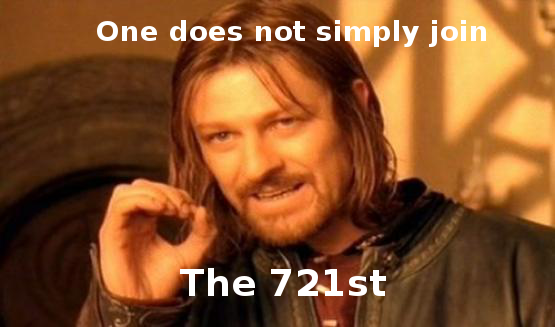 The 721st is an ARRL Affiliated Club chartered in 2013. Beyond that, any reference to the term club is somewhat meaningless. We have one meeting a year that coincides with our annual Awards Dinner. All "procedural" matters are handled at that time. What?? No meetings?? How do you function? Quite well actually! In case you haven't noticed, thanks to the internet and social media most people are hyper-connected today, and we're no exception. We can get more done in a few text messages than other clubs can get done with a year of meetings. If meetings and parliamentary procedure are what you want maybe you should run for your local School or Land Use Board. You don't have a Treasury, don't you need money for your activities? As Grandma used to say: "You don't need to spend money to have fun!" Now with that out of the way, sure we do need cash occasionally. Our single biggest group expense is probably Field Day, and that's mostly to cover the cost of food and sanitation. All other expenses are borne by the principals of the organization. The club has no assets. All equipment is individually owned. We generally resort to fund raisers, passing around the hat, or pot luck. No Treasury, No Arguments, No Exceptions. Do you ever meet face-to-face? Certainly, when there is a reason to. We usually have a monthly "hang-out" that coincides with our monthly VE SESSION. As you can imagine, extremely informal except for the serious business of administering FCC Part 97 exams. Registration for exams is required. If we don't have any candidates we might not have a hang-out. Wow, this is awesome how do I join? You can't. There are no members. We've found that "membership" in a club conveys a sense of "entitlement" to the "member." Many people feel just by paying dues and showing up once in a while, with no other participation beyond that, gives them a say in how the club should function. We don't exist to entertain you. Just to be clear, this is not a Democracy. The terms "Oligarchy" or "Benevolent Dictatorship" are probably more accurate. With all of that out of the way, we are always eager for talented people to join us. Even if you are new to radio but are eager learn and not afraid of being put to work contact us! Also, you should know in advance: being called "Jackass" is of the highest honor in the 721st.